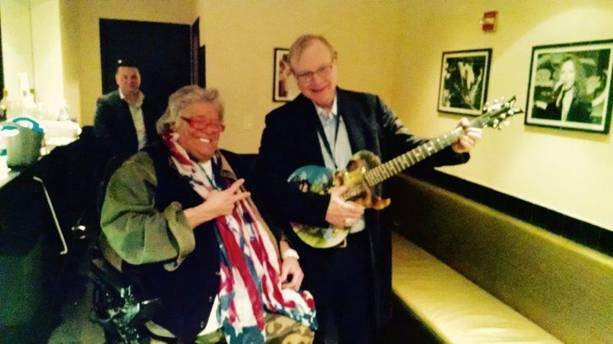 New York, NY -- On Thursday evening at BB Kings in New York City, Leslie West welcomed long-time fan and Microsoft co-founder Paul Allen. Pictured below are West and Allen, shortly after the guitarist presented one of his signature model guitars to the historical figure. On November 20, Leslie West will release Soundcheck via Provogue / Mascot Label Group, his latest studio recording which features appearances from Jack Bruce, Brian May, Peter Frampton, Bonnie Bramlett, Max Middleton and others. West will celebrate his 70th birthday on October 22.